Holiday dilemma: Feast with the in-laws or your own family? 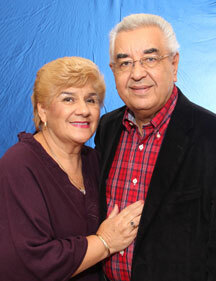 Anna and Gil Vega, members of Christ the King Parish in Philadelphia, have been married 47 years. They served as a team couple in the Worldwide Marriage Encounter movement for 13 years. Maria: The holidays will be here soon. I love this time of the year; Thanksgiving, Christmas and New Year’s are all a time for sharing with friends and family. The smell of pumpkin pie, cookies, cakes and Christmas decorations puts me in the spirit of the holidays. As the candle on the Advent wreath is lit each Sunday, my anticipation grows. My excitement is almost complete, however I worry about John’s family who insists that we spend the holidays with them. I love his family, but I would like to start our own family traditions with our children. They want to stay home to celebrate with their friends and other relatives from my side as well. We never share holidays with my family. It would really be simpler if we could all take turns. I do hope and pray that this year we can stay home and joyfully celebrate and begin new traditions without hurting anyone’s feelings. John: My family loves the holidays with all its traditions. I come from a big family and during these special times, we come together to reminisce and catch up with each other. This means a lot to my parents. They look forward every year to having all their children come together. Maria has been talking about staying at home for the holidays and beginning our own family traditions. I am not against staying home but my family will be very disappointed. This special time is sacred to all of us. We do not see each other often. Everyone is busy with their own lives, and the holidays are the perfect time to share and bond together. If we stay home during the holidays, I do hope that we can work something out that will be helpful to all so that we can continue to gather as a family, the way it should be. This is what the holidays are all about, FAMILY! This situation is not unique to Maria and John. Many families struggle with similar situations. It is important to remember that the joining of two people in marriage is also the joining of two families, each one with their own customs and traditions. There must be some compromise from each spouse. Remember that the two of you form a partnership; you must not focus on your own wants and needs over those of your spouse. In the Bible Genesis 2:25 speaks about man leaving his father and mother and that he and his wife become one flesh. This seals the unity and loyalty that should exist in the relationship of the spouses. Try to divide the holidays to spend time with each family. Some families set aside the week before or the week after to celebrate together rather than on the day of the holiday. Holidays are a time for peace and joy with family and friends. Together you must decide how you want to begin traditions that will be unique to both of you, because you established them together.